YOU DECIDE - BEST IN BLUE, LARIMAR OR QUARTZ? There's something about a sky-blue stone that makes me catch my breath. The color is so cool and refreshing and, especially when the color has lighter markings through it, fascinating, like it wants me to tell its story. One mineral I've wanted to work with--a lot--is larimar. This sunny day stone with remarkable white markings always looks like it's got secrets it wants me to share. One hold-back for me has been the cost. At the shows I've been to where it is being sold, it's been about $0.65 a gram and up. If I wanted enough to make several small cabs, I was talking a lot more than lunch money. So, up until now, I've looked a lot, but I haven't taken any home. Notice I said "until now". It all started when I was at Quartzsite last winter. I found a vendor who had some blue slabs that caught my eye. Could they be larimar? If so, the price was so low I was going to get a whole bunch of the stuff! The vendor said I wasn't the first to ask. However, while his slabs look a lot like larimar, they're actually blue quartz from China. Here's one of the slabs I purchased from him for $17.00. IS IT LARIMAR, OR IS IT QUARTZ? 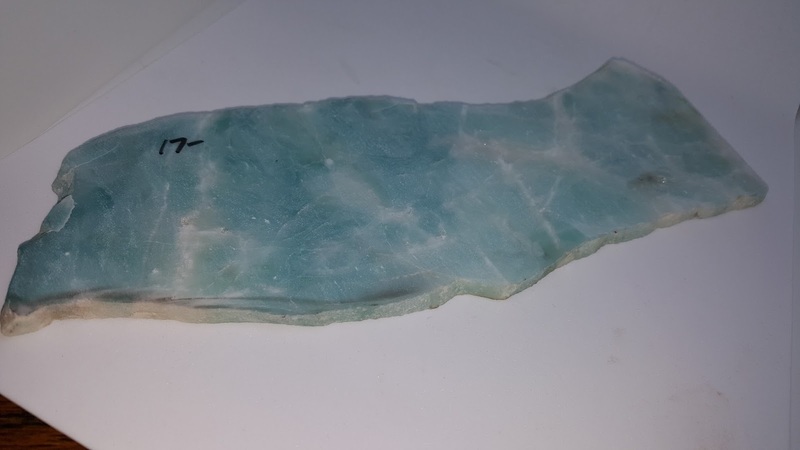 Then in the interests of full investigation, (It sounds better than I finally found an excuse to buy some larimar 😏), I looked online until I found larimar available in small slabs and purchased a bit. Then to test whether or not they actually looked as much alike as I'd thought they would, I made a cab of each stone. Can you tell which is which? I'll tell you at the bottom of the blog. So, they really look a lot alike, but there are several significant differences. 1, Hardness (you thought I'd say price first, didn't you?). The quartz clocks in on the mohs scale at 4.5-5, the larimar is noticeably harder, coming in at 7 on the mohs scale. 2. Availability When I found this, it was the first and only time I've seen this particular blue quartz. 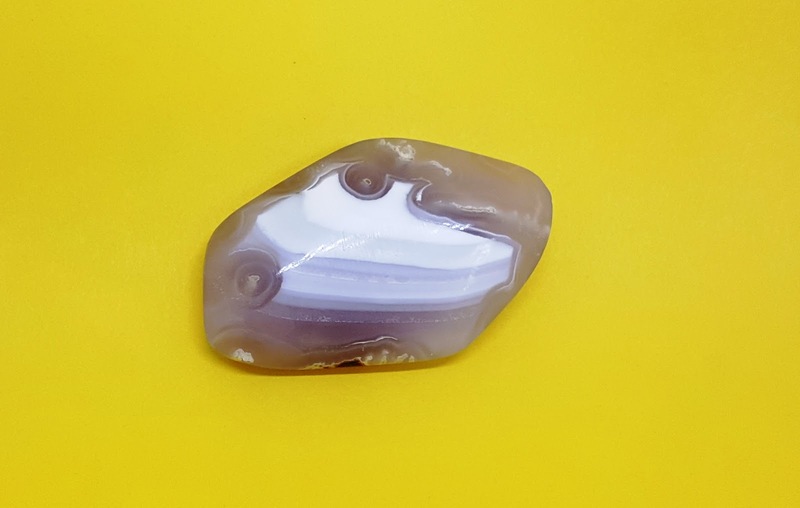 I've looked online and found a lot of blue quartz listed as healing stones, but none of it had this particular color with the white included. However, it does not have the distinctive "blossom" markings often found in larimar. On the other hand, larimar is pretty widely available, if costly. 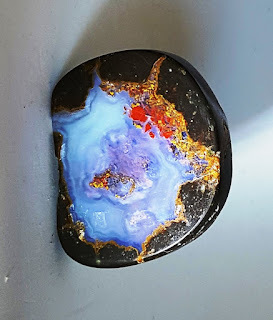 I purchased mine from ncestones on eBay, but there are many other vendors out there selling all qualities of this mineral. 3. Price Okay, this was a math problem. Everything had to be converted to one scale in order to compare prices realistically. I decided to go with grams, since that's something we frequently see as a weight measurement at shows. At shows, the price for larimar I've seen most often is $0.65/gram. The larimar I purchase on line was sold by the carat weighing out at 274.5/ct. I converted it to grams and the price was $0.44/gram. My slab weighed out at 3592 grams. I paid $17 for it, coming out with a price per gram of $0.005. Yes, that's right, roughly one one-hundredth of the price of the larimar. As you can see, there can be an enormous difference among the prices you can pay to make a pretty blue cab. There is a significant price cut to purchase online, but you have to count on the pictures to know what you have (if possible, see both sides because if the "b" side is important to you, you want to be sure it looks great). But, the shortcoming of purchasing online is that you can't see it and touch it before you purchase. While the blue quartz does make some lovely cabs, the larimar wins my vote for rock to cab. 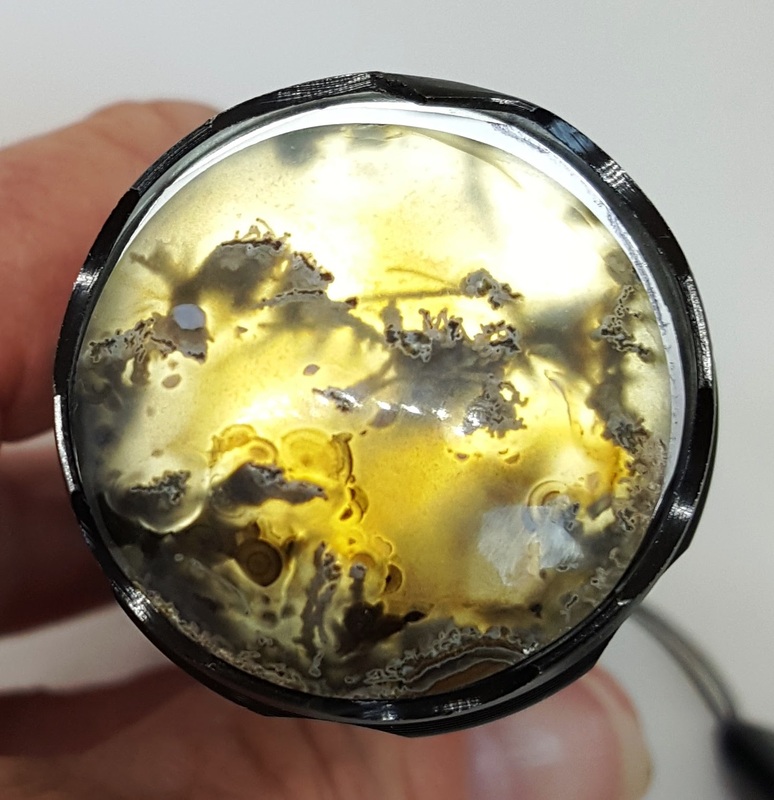 Since it is much harder than the quartz, it takes a much, much better shine! 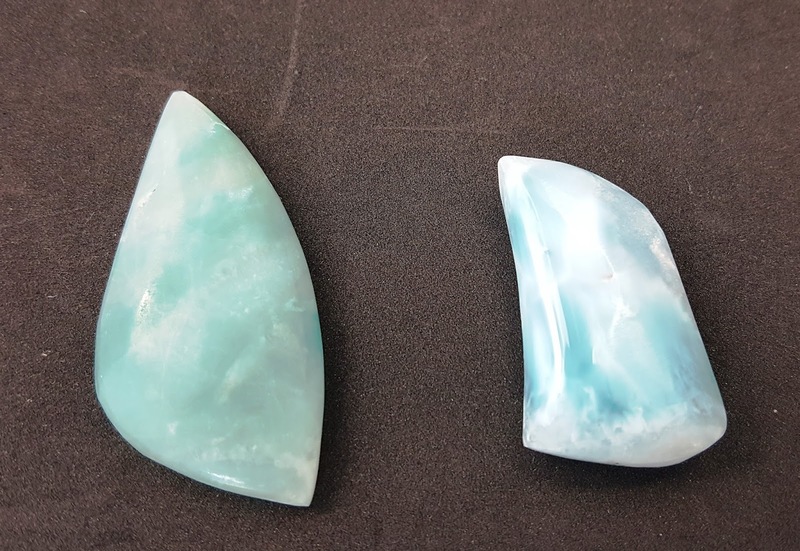 The larger stone on the left is the quartz, the smaller stone on the right is the larimar. Did you guess right? I'd love to hear from you. 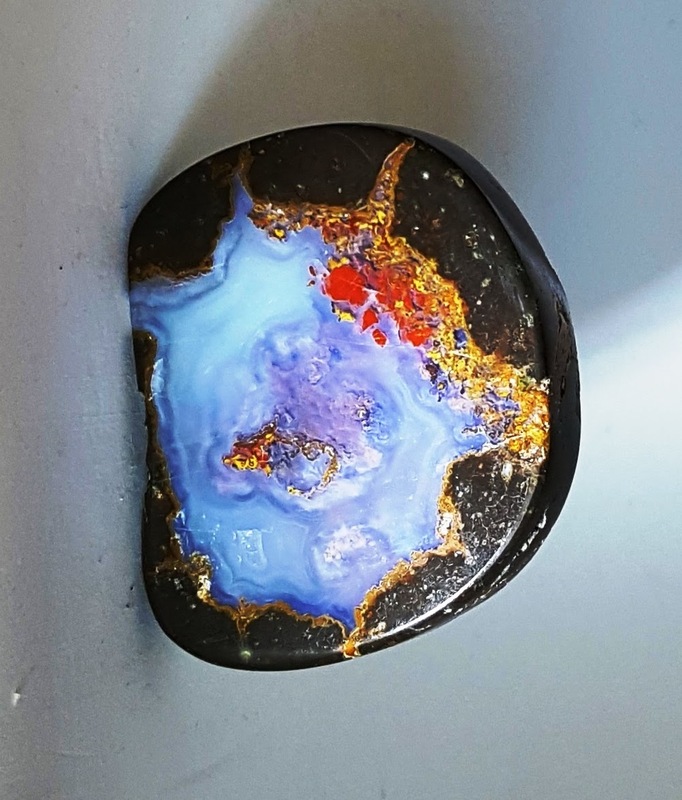 Let me know about the rocks you're working on Just click on the "Comments" section below! I used to think that thundereggs were, to be honest, boring. The first ones I found had milky-colored stones that were often too small, misshapen, or simply not interested in telling me a story. Then, I started getting lucky once in a while. 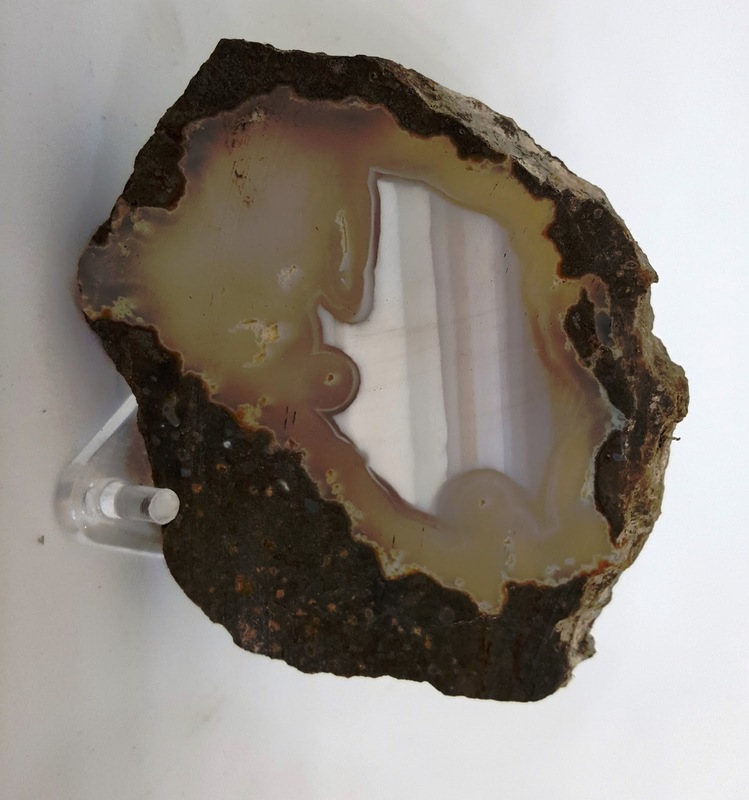 The first lucky thundereggs were table agate stripes of quartz layers in different shades like this one. Now, in and of themselves, these stripes aren't all that fascinating, but the thunderegg assured me that I'd find a story if I just kept looking. The one thing I was sure of was that I did not want to include any of the non-quartz material in my cab, so I sliced this and decided to go with a free-form shape and see what happened. I found a little race car! In the picture you can see the rear wheel and the head of the driver in the cockpit. The circles are cross views of tube agates that also grew with the table agate inside the thunderegg, but were not visible until I had ground the agate into the curved cab shape. I had designed the free-form shape of this cab before I started grinding, so I didn't know about the car yet, but I love the way the shape makes the car look like it's moving. This slab from a double thunderegg had a lot of moss running through it. It turned out to be mixed blessing. On one hand, the moss itself is lovely, however, on the other hand, the quartz is a smokey gray color. I was ambivalent about working it until I saw it back-lit. It was amazing! The smokey color faded out to yellow and the fanciful moss became distinct with crisp edges and gave the impression of floating. It's a nice cab for my collection, but I doubt I'll ever mount it for jewelry because it's much less impressive without the back light. 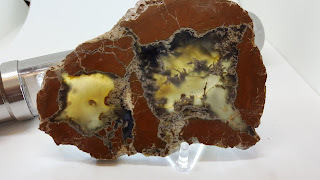 Earlier, I mentioned that I I don't like to include the non-quartzy material when I make cabs from thundereggs. In working with the exterior material, I've had problems because it tends to be somewhat soft, happy to have small chunks fall off, and refuse to take a polish or even a bit of a luster. For this free-form, I would have lost the full shaping of the material, and I was afraid I'd also lose the golden color. 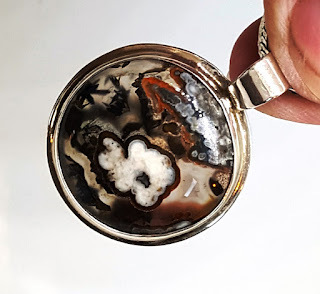 When I made this shape, I could feel the gold colored material and it was slightly rougher than the agate center, so I didn't want to get in close and risk losing the red and gold embellishments. For those of you noticing the cab is on its side, well, no matter what angle I took the photo from, and no matter how many times I edited it before bringing it into the blog, it kept insisting on returning to this view. Since my rocks tend to talk to me, I finally decided it was saying it liked this view best. So it is what it is. I also love the way the interior circle-ish shapes give the impression that it is a blue whirlpool and it is breaking off parts of the gold edge and swirling them away. 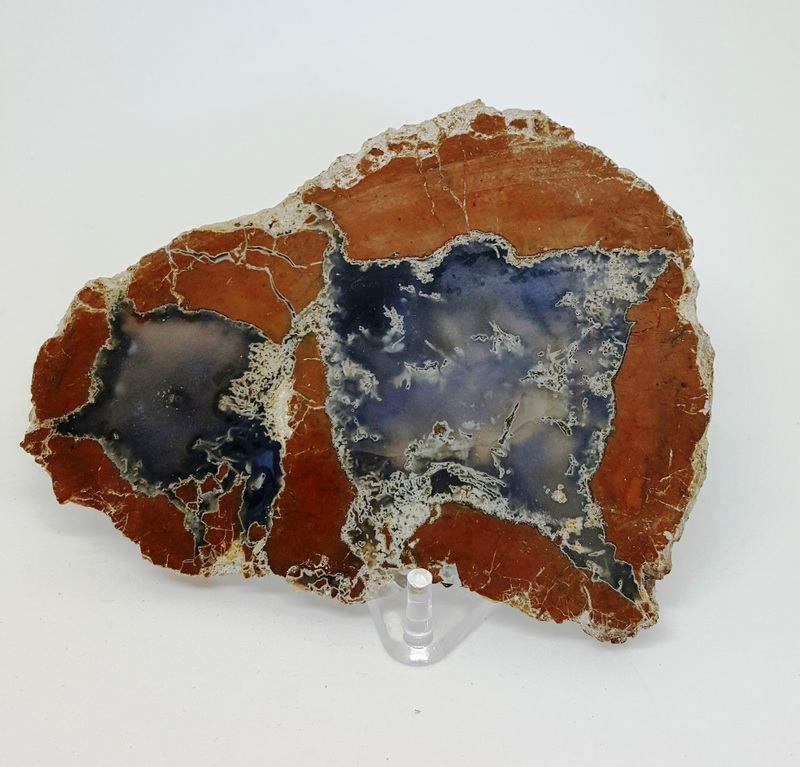 Have you ever found a really incredible cab inside a thunderegg? If so, send me a picture and maybe I can use it in another blog post.Click here to reach me!